MarylandReporter.com got a couple of dozen emails about the Rascovar column, some supporting, most against. At least half were from people who were not regular readers of MarylandReporter.com. Few actually dealt with the substance of the column, calling it “trash” and “lies” with no specifics. Here are responses from three well-known and regular readers with something substantive to say in response. On Tuesday, we reported on earlier blowback about the column, including a call to boycott the website. Del. Pat McDonough describes what he thinks has caused the problem on the Mexican border, and how to solve it. In an email, Congressman Andy Harris resented being lectured about his own faith and slurred as a racist, and writer Jim Simpson disputes Rascovar’s facts and the editor’s judgment in publishing them. President Obama and the usual cast of characters are attempting to create the impression that the chaos on our southern border is a humanitarian problem. They lie. The truth of the matter is that the disorder on our border is caused by a criminal conspiracy promoting human trafficking for big money. The plot begins in Central America where the drug cartels make a deal with ordinary people that forcefully encourage them to place their children, or other family members, under the protection of the gang. After this modern form of slavery is concluded the gang bangers then force part of the family, especially the children, to flee north to America with a promise of paradise on earth. The MS-13 gang, the Mexican Mafia, and others then charge each client between $5,000 and $10,000 to guarantee their safe arrival. The family members remaining in Central America then become indentured servants to the gang and must work off the debt. The second phase of the conspiracy is played by the politicians in Central America and Mexico who aid and abet the supporters of the scheme. Recently, the President of Mexico signed a formal agreement with the Presidents in Central America to sanctify the entire plot. The third phase involves another group of co-conspirators in the United States including President Obama who has failed to enforce the Federal Immigration Act, creating an environment where illegals, once safely in our country, will remain here. Obama’s policies are lending truth to the tactics used by the gangs in Central America that created this unholy chain of events. Of course, the real victims of all of this are the American people who pay the taxes that support all of these unlawful activities, suffer the displacement of jobs, and are forced to be damaged by the consequences of these dangerous policies. Another major player on the conspiracy chain is Gov. Martin O’Malley. O’Malley not only wants as many of these children as he can get to flood into his state, but he wants to disperse them into neighborhoods using group homes. O’Malley’s plan is to use the Foster Care system which is already in disarray and dysfunctional. I can’t imagine a 7-year-old child who cannot speak English residing in a group home on the mean streets of West Baltimore. He might feel like he is back in his old gang-infested neighborhood. A full disclosure website providing 24/7 access to the public containing information regarding the number of certified ‘unaccompanied minors’ admitted to the program, amount of state funds used, the names of organizations or group homes receiving funds, and a list of locations where the clients are located by zip code. I believe this is a common sense and practical approach that would protect the citizens of Maryland and provide them with information they deserve to have access to in the spirit of transparency. This is a non-partisan initiative. I have sent copies to all of the other lawmakers in the Maryland General Assembly. The most amazing aspect of this proposal is that all of the points that I am suggesting can already be placed into practice by the governor. Hopefully, this legislation will provide an opportunity for the people to have a specific goal to rally around. Gov. O’Malley and other politicians have transformed Maryland into a Disneyland for illegals by providing free rides and benefits at taxpayers’ expense. This latest ‘illegal benefit program’ is another glaring example of O’Malley’s bad habit of placing the needs of illegal migrants above the needs of the citizens that he is supposed to represent. In the final analysis, not only has Obama failed to enforce the Federal Immigration Act, but he is misleading the American people by misinterpreting the language of the ‘unaccompanied minors’ law. My solution is simple: Construct a tent city on the border to house our uninvited guests. We can utilize the surplus of tents from the Iraq and Afghanistan war zones. These are not field tents used by the Boy Scouts, but are modern facilities containing air conditioning, kitchens, medical facilities, and appropriate private sleeping quarters. They were good enough for the men and women serving America in our military forces. An appropriate number of immigration judges could be sent to the border and quickly hear the cases and return them back to their homelands. This decisive action would send a clear signal, not only to the gangs, but the people of Central America, that the scheme is over. Obama’s open door policy is dead. The American people are compassionate, but sometimes their heartfelt thoughts forget that we have starving children in our own nation with neighborhoods infested with crime, drugs and gangs. It is time for Obama and O’Malley to begin to display their concern and compassion for the needy people of the United States of America. I’ll be brief. I totally agree with Dan Bongino –it was a hate piece, pure and simple. As a Catholic son of immigrants, I suppose I should resent being lectured to by Mr. Rascovar about my faith and my heritage (i.e., Republicans disliking anyone who is not an Anglo-Saxon Christian immigrant, or taking the Pope’s comments out of context), but Republicans being called racist by hypocritical liberals (who oppose inner city school choice or vouchers, oppose policies to encourage nuclear families in our minority communities, etc.) -is not new, original, or likely to end soon. Too bad you chose to allow an outlet for such venom. Dan Bongino responded vigorously to a truly objectionable screed about the illegal alien issue by Barry Rascovar, posted at Maryland Reporter yesterday, and demanded it be taken down. Maryland Reporter Editor Len Lazarick responded today, saying that wouldn’t happen. I receive Maryland Reporter’s daily emails. Unaware of other objections, I had sent Len an email response of my own, asking why he would “allow such fraudulent hit pieces on Maryland Reporter.” The publication usually sticks to the facts and goes out of its way to remain moderate in tone. I felt the post to be entirely out of character and beneath Maryland Reporter’s standards. Editors are free to pick and choose what to publish. But what they do publish reflects what they view as acceptable public discourse, regardless of whether they agree or disagree with it. When someone chooses to publish a post like Rascovar’s, it reflects seriously bad judgment, not because of Rascovar’s views on illegal aliens, but because his was a blatantly fraudulent hit piece. He started by calling Republicans “narrow-minded bigots,” imputing to the GOP a mindless bit of graffiti sprayed on a Carroll County building that spelled “illegals” as “illeagles.” Who did that? Do we even know? No we don’t. Such actions frequently turn out to have been the work of leftist partisans. Yet Mr. Rascovar is willing to condemn the entire GOP. Conspicuously overlooked is the GOP’s actual historical record. He has heard of Abraham Lincoln, surely. If he is really going to go there, he should note that it was the GOP, decidedly not Democrats, who freed the slaves, paying dearly in lives and treasure. It was the GOP who pushed civil rights legislation through Congress, not Democrats, while both Kennedy and Johnson cynically strategized how to move blacks into their voting column by creating a new form of slavery: welfare. He then went on to call Sheriff Chuck Jenkins, one of the most principled, dedicated law enforcement officers in Maryland, “Frederick County’s arch-enemy of immigrants.” Is Mr. Rascovar, a veteran journalist, unfamiliar with the English language? 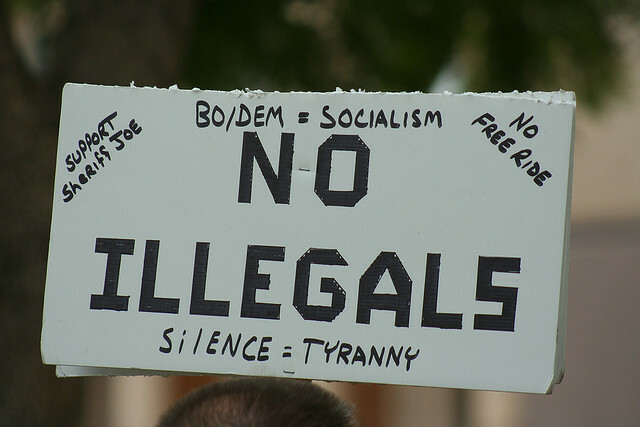 According to Webster’s dictionary, “immigrant” is defined as “a person who comes to a country to take up permanent residence.” An “alien,” on the other hand, whether legal or illegal, is a person “relating, belonging, or owing allegiance to another country or government.” A resident alien can be considered an immigrant because the term describes a person who has established legal residency. An illegal alien cannot be an immigrant because he/she is breaking the law and thus cannot confidently claim residency. But to promote their fraudulent agenda, the Left conflates the two. Sheriff Jenkins is not anti-immigrant. Sheriff Jenkins is a law enforcement officer, and illegal aliens throughout Maryland are breaking the law, both simply by being here and also committing extensive crimes. Are not the criminal activities of legal Marylanders enough for law enforcement to deal with? Governor O’Malley inflicts an additional $2 billion in annual costs on Maryland taxpayers by laying down the welcoming mat to illegals. Don’t we have enough troubles without that added burden? I praise God for people like Sheriff Jenkins. I only wish more Maryland law enforcers would follow his dedicated example. Republicans who care about the rule-of-law could care less if the illegal alien is from Mexico, Guatemala, Honduras, or if he is a lily-white Englishman who just walked off the set of Downton Abbey. They are breaking the law, and if you want law to have meaning, it must be enforced. Rascovar ridiculed Jenkins’ assertion that illegals are drug smugglers, human traffickers and so forth. He must not have read anything but his own lousy columns. Unaccompanied children represent less than one-fifth of the approximately 290,000 aliens who have been apprehended at the border this year by the Border Patrol. And many of those “children” are in fact MS-13 gang members, or youths of gang age that MS-13 and other gangs are actively recruiting. Mr. Rascovar, at least get your facts straight! But that would ruin the narrative, and his phony narrative is what Mr. Rascovar wants. It has been the Left’s never ending political strategy to cast anyone who disagrees with their radical, destructive plans as “racist,” “sexist,” “homophobe,” “xenophobe,” etc. This has been the Left’s mantra since Lenin and Co. began their offensive against the West 100 years ago. Mr. Rascovar is merely carrying on the tradition. Anyone who allows such a message to go forward is in essence promoting radical leftist propaganda. It is designed specifically to demonize anyone who disagrees with them and polarize society. The facts of this controversy are not in the same universe. Conservatives believe in the rule-of-law because, guess what, that is what runs our nation. It is what has given America freedom and prosperity unmatched in the history of the world. It is what legal immigrants are inspired to come here for, while illegals cheat both them and American citizens of the opportunities. Without the rule-of-law we have anarchy, and that is exactly what the Left is demanding! They are deliberately setting out to wreck our country. They do not have a shred of legitimacy in their argument, and calling names as Rascovar does – it is ALL he does – is intellectually unprincipled, lazy and dishonest. Obama and Co. have illegally encouraged this mass migration for the conspicuously self-serving purpose of packing the rolls with future Democratic voters, while creating chaos in our nation and hoping to lay it all at the GOP’s feet for the 2014 elections. It was a desperation move borne of the recognition that Democrats are going to lose big time in November given Obama’s endless scandals and disastrous policies. This is a distraction, a deception, and unworthy of a sitting president. Children are being raped, beaten, robbed, kidnapped and murdered because this president sent Central America a message: “I will take care of you.” That is what these illegal kids are telling the Border Patrol. All so the Democrats can cobble together some more votes! It is a national disgrace. A publication that allows such utter tripe as Rascovar’s screed spreads misinformation and hatred, polarizing and discrediting the only people standing up against this monstrous agenda. Meanwhile it legitimizes what is nothing more than a base political tactic that has defined the Left since Saul Alinsky first codified it in his 1971 pamphlet “Rules for Radicals.” Publish such tripe if you will, but it is a terrible discredit to your usually informative publication.